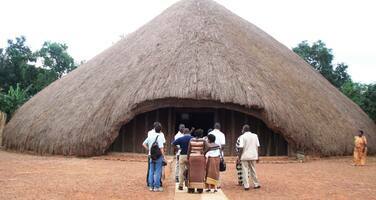 2011-2012: 68,365 USD from the Japanese FIT for an Expert Project Appraisal Mission for the reconstruction of Muzibu Azaala Mpanga of the World Heritage property of the Tombs of Buganda Kings at Kasubi. April 2010: World Heritage Centre mission; November 2010: World Heritage Centre/ICOMOS/ICCROM reactive monitoring mission; August 2011: World Heritage Centre mission; November 2011: World Heritage Centre mission; April 2012: World Heritage Centre/ICOMOS/ICCROM reactive monitoring mission. A report on the state of conservation of the property was submitted by the State Party on 16 February 2012. From 2 to 9 April 2012, a joint World Heritage Centre /ICOMOS/ ICCROM reactive monitoring mission was carried out, as requested by the World Heritage Committee at its 34th session (Brasilia, 2010). The mission report is available online at the following Web address: https://whc.unesco.org/en/sessions/36COM. A research project on the traditional building practices of other Ganda Tombs was started, the results of which will provide the detailed plans for the reconstruction of the Kasubi tombs. The project includes study visits to the sites, documentation of practices and interviews with elders who have a custodial role to skills and practices, as well as additional archival research. The mission reported on the different activities that have been undertaken regarding research on traditional Ganda architecture and its intangible aspects, as well as the pilot projects implemented and the application of knowledge and skills in the reconstruction of the Tombs. It noted that there is a need to consolidate existing work and documentation carried out to substantiate decision-making processes on the reconstruction of Muzibu Azaala Mpanga and to strengthen the links between the tangible and intangible aspects of traditional Ganda royal architecture to assist its conservation and management. It further recommended increasing research partnerships with Makarere University and other institutions. The State Party indicates that the tangible and intangible aspects of the reconstruction process are being compiled and will be included in an illustrated report. Aspects documented so far include meetings, construction phases and physical construction process. Records include written reports, sketches and design drawings as well as photographs. The mission reported that restoration works started at Wamala Tombs in March 2012, which constitute the official start of the Kasubi reconstruction. It noted the works implemented and the challenges faced regarding technical issues that have been highlighted by the UNESCO-Japan 2012 mission report. It underscored that a timeline for the Wamala works needs to be completed and integrated within the Kasubi Action plan. As for the Muzibu Azaala Mpanga project, the mission noted that the timeline for the completion of works is not accurate and needs to be revised, establishing a critical path with proposed benchmarks. It further noted that details in the design drawings will be informed by the results from the research project as well as from the renovations and repairs carried out at Wamala. The State Party reports that the Buganda Kingdom has developed a Master Plan for the reconstruction and conservation of the property. Based on the recommendations made by the World Heritage Centre, the process is to be revised and a work plan developed for implementation. No timeframe was mentioned as to when this process is expected to be concluded. The mission reported that discussions with the National Technical Team were carried out on the concepts and contents of what the Master Plan would entail and the link with other planning tools for the property and its surroundings. The State Party reports that the new Management Plan has been launched and that implementation has started, including the appointment of a site manager. The mission noted that the current 2011-2015 Management Plan takes into account recommendations made by the November 2010 mission and that the established vision and principles are being adhered to. However, it does not include provisions for land uses or activities to sustain the Outstanding Universal Value of the property. These shortcomings, along with the detailed inventory of significant tangible and intangible features in relationship with the broader landscape, need to be addressed for the revision of the Management Plan to adequately identify actions for their conservation and management. The revised Management Plan should also address issues of collaboration among diverse stakeholders and deal with issues such as urban pressure and encroachment and contain a detailed risk Management Plan. As for the custodians and the widows that look after Kasubi Tombs, the State Party indicates that they have all been registered on the pay-list of the Buganda Kingdom and are being paid at the end of each month, a sign of recognition from the Buganda Kingdom. The Nalinnya, as the chief custodian, facilitates provision of food supplements twice every month. The mission confirmed the active involvement of custodians and training initiated on site and recommended that they take a more active role in the management team, with recognised roles and responsibilities. The report from the State Party mentions that the reconstruction of Kasubi Tombs is a tripartite arrangement between the Ugandan Government, Buganda Kingdom and UNESCO. The Government of Uganda will donate USD 700,000 and the Buganda Kingdom USD 150,000. The component of Fire Fighting and Disaster Risk management is being addressed by the Japanese Government who will donate approximately USD 650,000 for the project through UNESCO. The strategy for Kasubi Tombs has yet to be completed but work has commenced on the preparatory and emergency measures to protect the property. The UNESCO-Japan project will not only look at issues of disaster risk management, but will also include a research programme on thatching of royal tombs conducted by Japanese experts. The inner fence to protect the main site from being accessed from all angles is completed; access is only from the recognized main entrance. The mission reports that the Site Manager has received training on disaster management in 2011 in Japan, and has produced a preliminary strategy which has yet to be fully developed. In addition, staff training has yet to be undertaken as well as providing equipment to ensure the protection of the property. Measures are already in place to build capacity of the artisans and to enable them to manage the reconstruction effectively. This effort is strengthened by the documentation of traditions and rituals and the transmission of know-how from traditional bearers from the Buganda Kingdom. The mission noted that progress has been made regarding training of thatchers and overall awareness raising but that a full-fledged capacity building strategy is not yet in place. Although the Management Plan includes some activities, this does not constitute an overall capacity building strategy, which needs to be comprehensively developed, and which would include components such as maintenance, resources management, conservation documentation training, among others. The State Party reported on the results from the August and October 2011 missions and their outcomes. It also mentions actions being implemented to address waste management and for the replanting of fig trees and a reed fence to deter trespassing and littering. The mission noted that planting of trees is a sustainable solution and that actions need to be completed to deter further encroachment. The World Heritage Centre and the Advisory Bodies note that there has been progress in improving the state of conservation of the property and in the implementation of the corrective measures adopted for the property. They note that in addition to the challenges faced in terms of the reconstruction strategy, it should be highlighted that urban encroachment and unregulated urban development can pose an additional threat to the property that needs to be adequately managed, through the definition and enforcement of regulations and guidelines, appropriate landscape management and larger collaboration among the diverse entities that have mandates pertaining to these issues. Interpretation and presentation are also aspects that need to be addressed. Finally, they recommend that the Committee welcome the support for the reconstruction of the Muzibu Azaala Mpanga, to be provided by the Government of Japan through UNESCO. 7. Requests the State Party to submit to the World Heritage Centre, by 1 February 2013, an updated report on the state of conservation of the property and the implementation of the above, for examination by the World Heritage Committee at its 37th session in 2013.